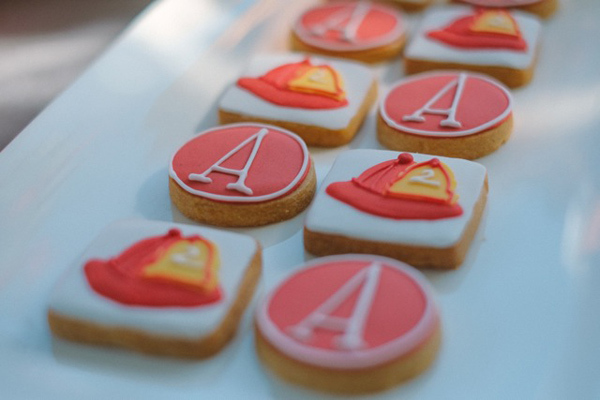 Ne-nah, ne-nah, here comes fireman… Archie? 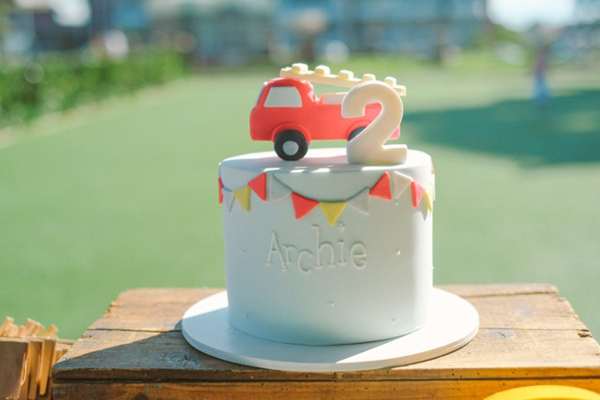 Yep, little Sydneysider Archie loves fire trucks so much that his mum had no trouble deciding what kind of party to throw when his second birthday rolled around. It was vintage fire trucks all the way. 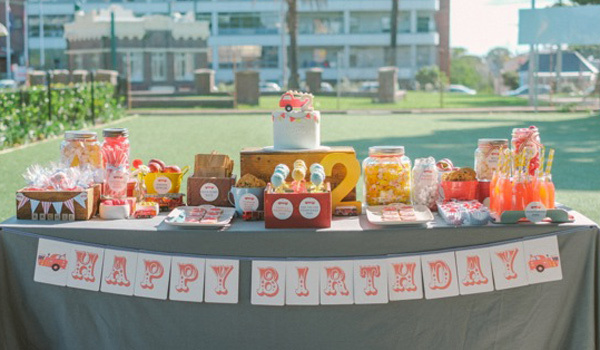 This party, held at the local bowling club, has so many simple and understated touches – like those washi tape A’s on the birthday hats up there – but the end result still manages to take your breathe away. 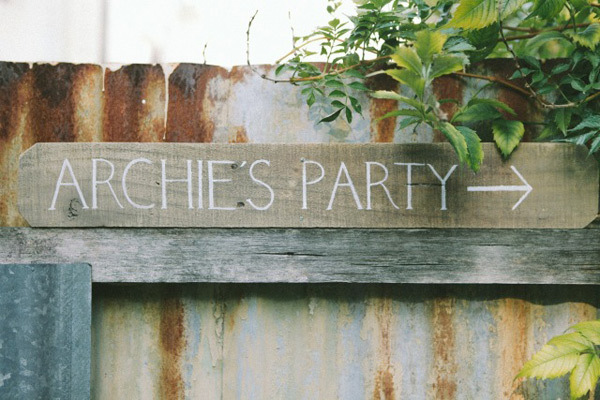 Guests were directed to the party via these rather lovely wooden signs, custom made by Waves and Weddings, while mum Sally made the charming bunting that gussied up the sweets table and little round food signs herself. 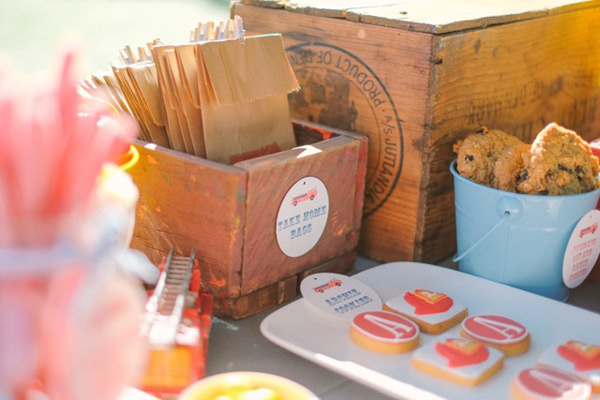 In keeping with the vintage feel, Sally used retro mason jars and old wooden boxes and crates sourced from local flea markets to hold many of the treats, while rustic tin buckets were also called on to do double duty as serving dishes. 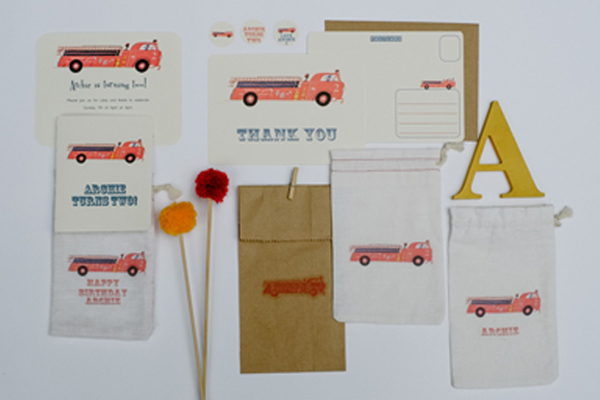 The battered old fire trucks doting the table were also vintage market finds. The food too, was simple, as befits a bunch of two-year-olds. 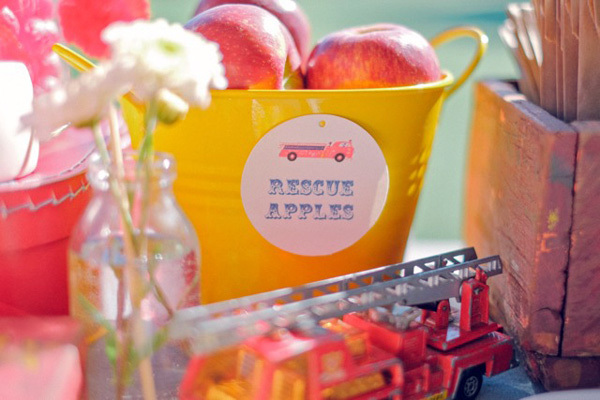 So crisp apples became “rescue apples”, homemade oat and raisin cookies became “fireman cookies”, homemade raspberry lemonade became “firefighting juice” and giant Jaffas became “great balls of fire”. 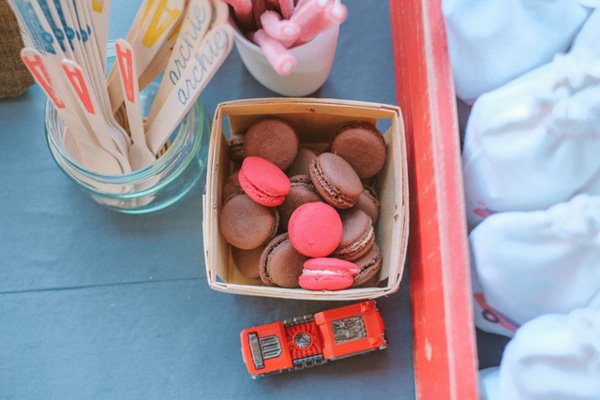 The toddler-sized sugar cookies, with their fireman-themed royal icing motifs, came from Polka Dot cookies, while the birthday cake – a marvel of chocolate mud topped with a fondant firetruck – came from Hello Naomi. Sally painstakingly stamped all the wooden cutlery herself, personalising it with the birthday boy’s name and first initial. 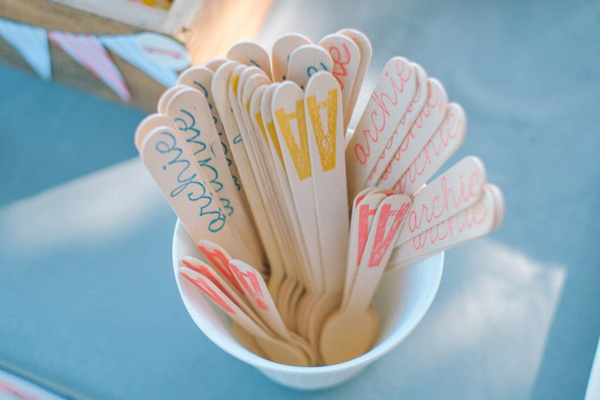 In fact, she had such a positive response from the parents of the little party guests that she has since opened up her own Etsy store, Archie’s Party, hand stamping cutlery for the rest of us. 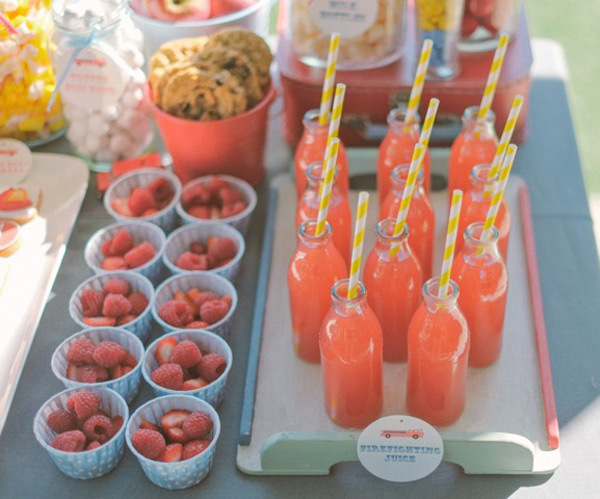 Now here’s another very sweet idea. 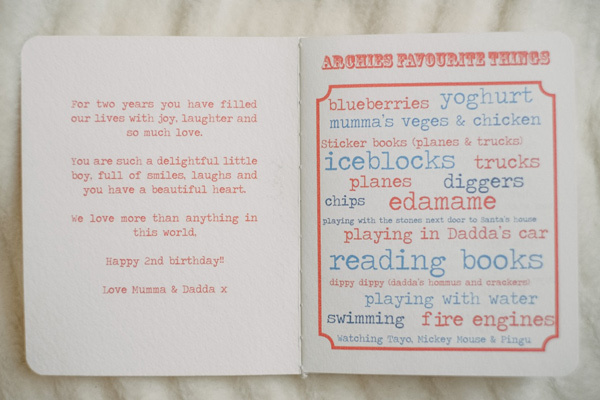 Sally created a special birthday book for Archie listing all his favourite things – the songs he likes to sing, the words he uses most often, the foods he enjoys the best, the toys that are closest to his heart. What a wonderful and sentimental keepsake. 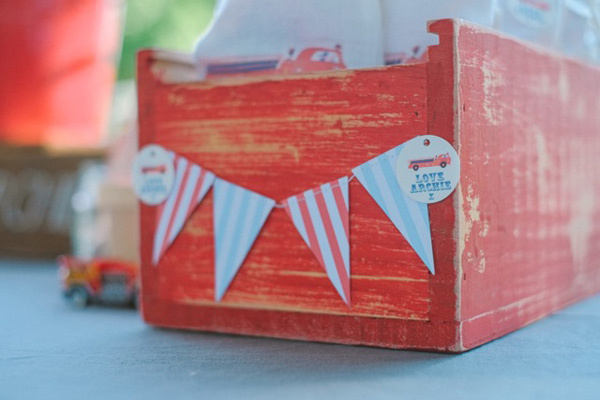 Here’s all the paper party paraphernalia – the invites, and the thank you cards from Rue Colbert paperie on Etsy – and the handprinted little cotton goody sacks that were filled with small treats and toys for the guests to take home. 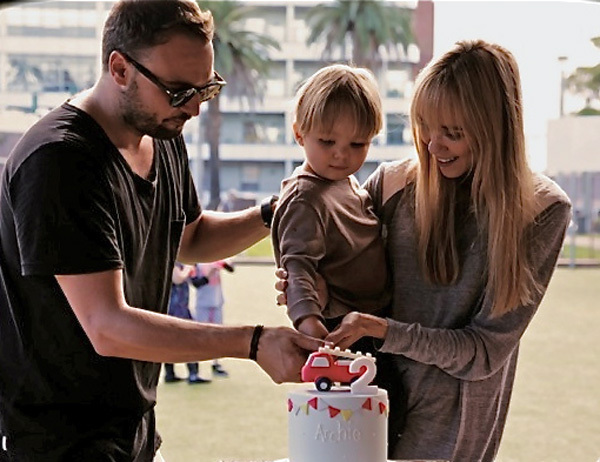 And finally, here’s the birthday boy cutting into that amazing cake with his doting parents. Thanks for sharing, Archie!